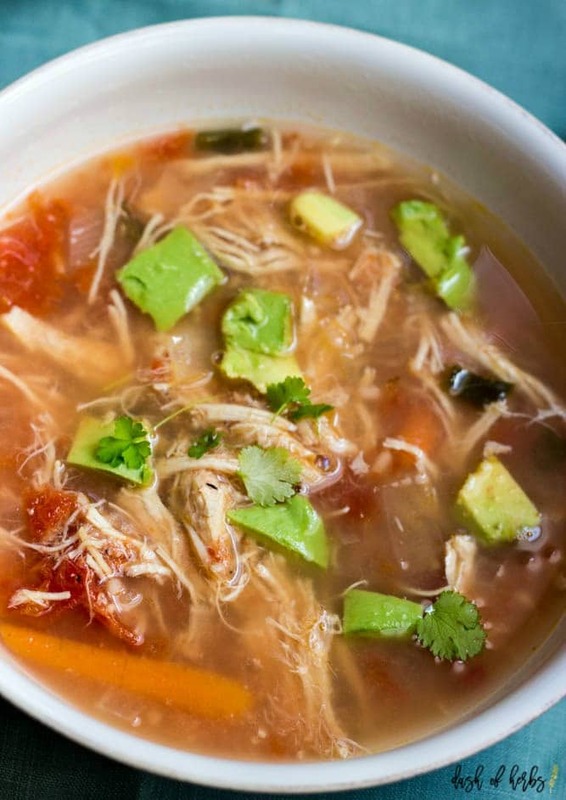 If you need a 0 Freestyle point recipe, try this slow cooker chicken tortilla soup recipe. 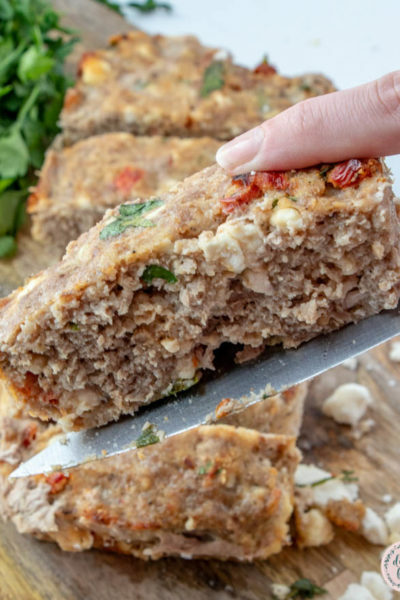 It can be thrown together very quickly and tastes amazing. I hope everyone’s Thanksgiving holiday was wonderful. Ours was so fun (except that I was terribly sick during it) and it was wonderful to host our first Thanksgiving. I loved cooking the turkey for the first time (crazy) and all the different side dishes we had. It was fantastic! 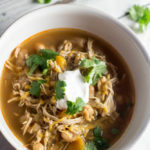 If you are sick of turkey sandwiches for lunch, try this easy slow cooker chicken tortilla soup recipe. 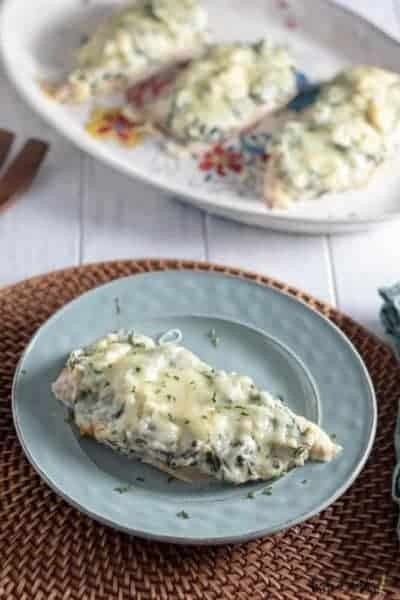 It tastes amazing – so flavorful and delicious – and can be thrown together in about 15 minutes. It’s that easy. 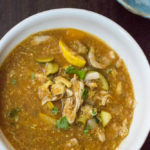 You can cook it on low for 6-8 hours and have lunch or dinner on the table easily. Do you ever wonder what life would be like without all the gadgets we now have in the kitchen? I can’t imagine life without my slow cooker. 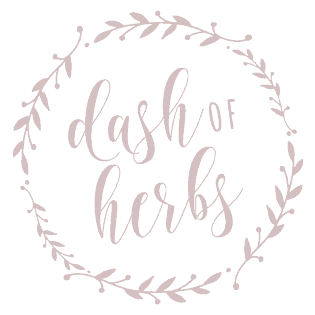 I use it at least weekly and I just love it. I can’t even fathom cooking all the time without it. How difficult that would have been. Our grandmothers are saints if they were able to cook dinner every night without a slow cooker. It’s amazing to hear their stories! I have to admit that as much as I loved our Thanksgiving meal, I am getting sick of the foods. I absolutely loved all of the food that we had, but it’s getting old. But I don’t want to be in the kitchen for hours. I did that cooking the turkey on Thanksgiving and I am happy to not be in the kitchen that long for a long time. 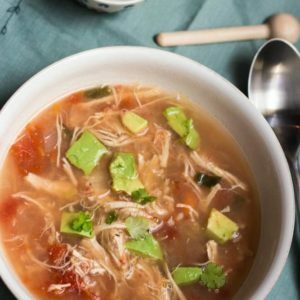 This slow cooker chicken tortilla soup recipe is so easy to make and tastes fantastic. 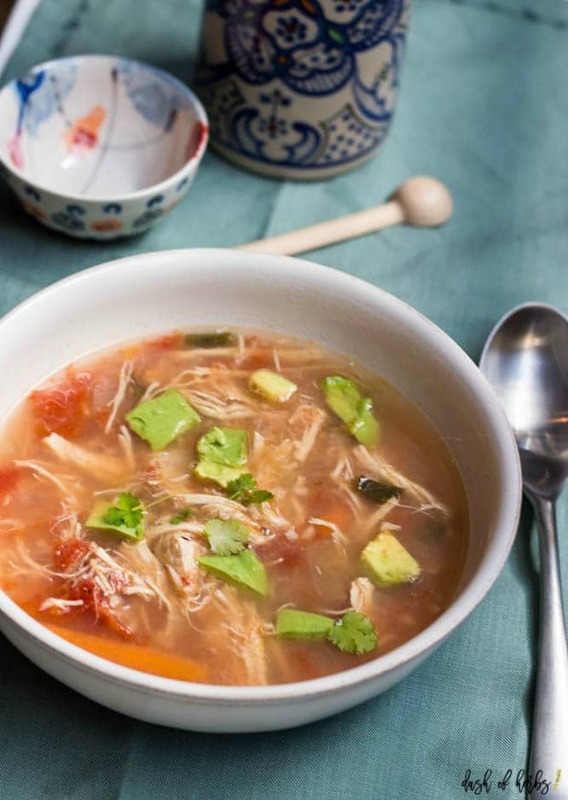 It’s is a simple chicken tortilla soup but it packs a punch too. Try it and enjoy it. 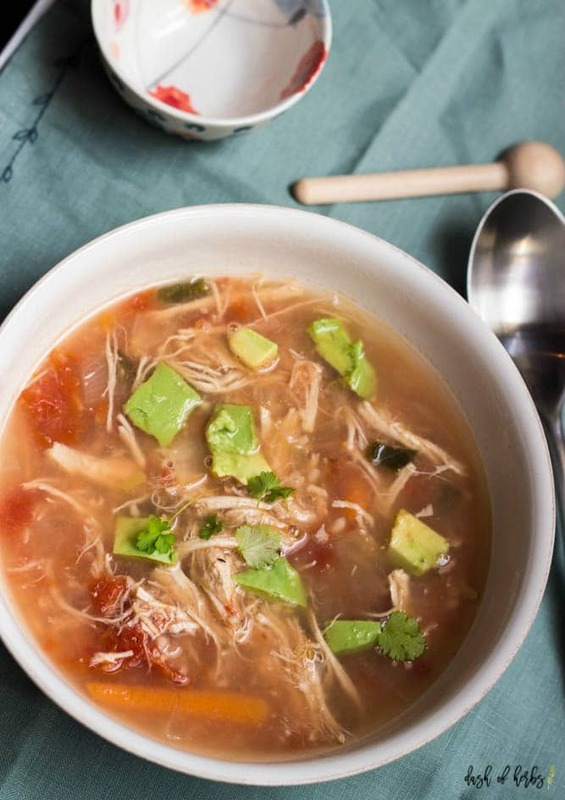 Put all the ingredients (except the avocado) into the slow cooker. Stir to combine everything. Cook on low for 6-8 hours. 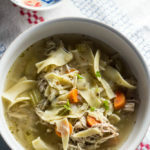 Once the soup is finished cooking, take out the chicken and shred it. 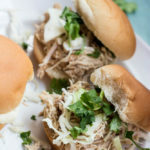 Return the shredded chicken to the slow cooker and serve immediately. 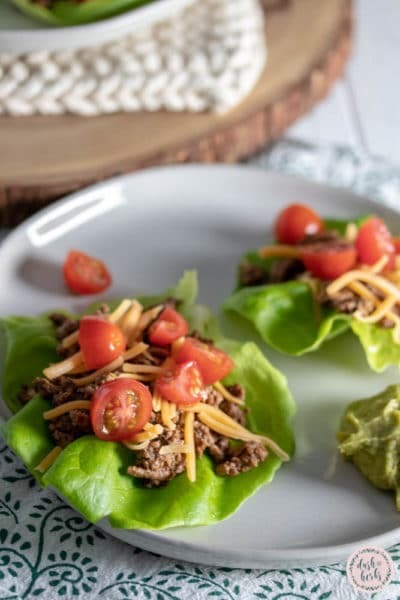 Top with the chopped avocado if you are using it. 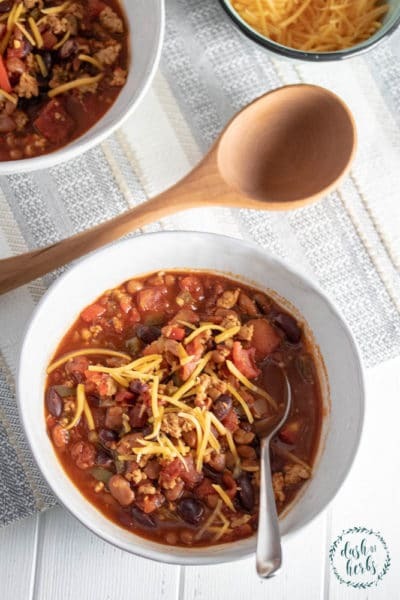 What are your favorite lunch recipes? 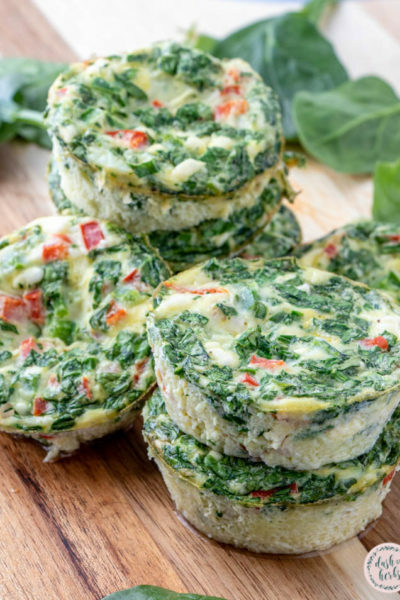 This recipe is 0 Freestyle points per serving, 1 cup. Combine all the ingredients (except the avocado, if using) into the slow cooker. Stir and place lid on the slow cooker. Cook on low for 6-8 hours. Take the chicken out and shred it. Replace it in the slow cooker and serve immediately. Add the chopped avocado to each bowl, if using. Oh that is a great idea. I think that would be awesome with this soup. You will have to let me know how it is to make your own strips. I have looked everywhere for tortilla strips at the store and I can’t find them. But you are more than happy to add them to this soup. I find that the flavor is the same with or without the strips (obviously no crunch if they aren’t in the recipe). If you add strips, the SmartPoints value will be different.